MORNING STAR HIDEAWAY is a rustic cabin with all the privacy and seclusion you are looking to sever connections with the noisy city and daily life haste. You will be instantly transported to wonderland in the forest and yet with all you need at your fingertips. MORNING STAR HIDEAWAY feature 1 Queen Size suit in the main floor, a Full Size suite in the 2nd floor and 2 Twins bunk beds bedroom in the second floor; accommodations for 8 guests with 2 full bathrooms and .5 service bath; in the basement there are also 2 twins.. 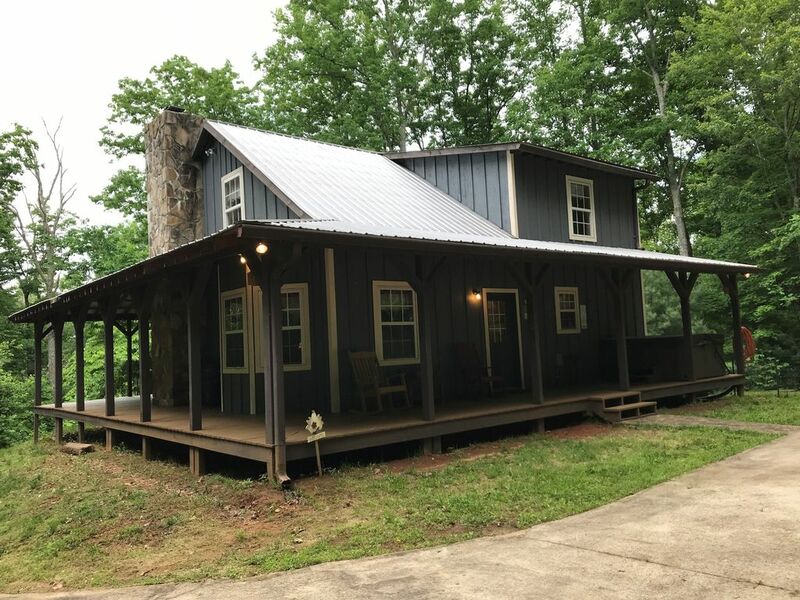 This cabin features a fully equipped open kitchen, dining area and iron wood burning stove is the focal point in the living area for a family sharing time or as a reading nook. Outdoors you will find a Hot Tub, sitting area in the rap-around porch. As soon as you arrive the feeling of a cozy cabin in the woods surrounded by high-rise trees, hardwood flooring and multiple windows letting plenty sunlight into the living areas will let you naturally relax and reestablish your communion with nature and with your loved ones. This is the place to create long lasting memories and come back year after year for shorts getaways or long vacation along with that special one in your life or the whole family including your 4-legged family friend. MORNING STAR HIDEAWAY is a Rustic Country Cabin quarried in the heart of the Chattahoochee-Oconee National Forest, 3.5 miles to Brasstown Bald the highest point at 4,784 ft with unique views of Mother Nature and intense hiking that includes Jacks Knob Trail leading to the Appalachian Trail. Other attractions are Russell-Brasstown Scenic Byway, Vogel State Park for fishing and swimming in the clear waters of the lake and TrackRock Archeological Area with remarkable rock art carvings by Creek and Cherokee Indians over a thousand years ago. Nottely River in Blairsville if you feel like tubing or fishing and Lake Chatuge in Hiawassee to enjoy from the marina; if you prefer some wine and tapas Crane Creek Vineyards in Young Harris after a full day of concerts and festivals at Georgia Mountain Fairgrounds. Don’t forget to visit Helen, the Bavarian Alpine village recreation some 20 minutes away. Loved our experience. Tons of room for lots of family. Close to all the hiking trails. Had a great time! Glad you and your family enjoyed your stay. A remark is needing to be make, arrival time is scheduled for 3:00PM not at 11:00AM, arriving so early to your cabin without informing us prevent preparing your cabin for your arrival. We’ll see you back soon. This cabin was a perfect getaway. Located in the mountains, nice and clean, welcoming and cozy. Loved the wood-throughout design with a fully equipped kitchen and linnens/towels provided. We would definitely come back. Thank you for this perfect getaway!! Thanking you for sharing your experience; our goal is always to provide you with excellent customer service for you and your family to enjoy your vacation. Please give us a call for your next getaway to apply your discounts as Frequent Guest. Last option - wouldn't go back! The cabin itself was small cute and charming, the decor was fine and hot tub was clean. However, it the cabin was only clean on the surface. Toilets had not been cleaned for a while, they had a pinkish rim on the basin. There was a year's worth of dust under the beds, there were tini pieces a glad in the kitchen sink that were probably there for the last visitor. Worst of all was the land field in the backyard , there was garbage littler all over! A dumpster, what a shame! To top it all, there was a gift basket whit expired products, including lays chips that expired in 2010!!! Lastly they had an old rotten porch swing that was not anchored properly, it fell apart when my daughter san on it and cut her leg. I emailed the property manager... have yet to get a reply. Needless to say, I won't be going back!!! We wonder the reason of your untruthful and misleading remarks, the cabin was cleaned and prepared right before your arrival, we know that if any of your comments were true you definitely will call our office immediately after your arrival rather than 2 days after your departure. We do appreciate sincere comments, but yours are absolutely false, you should be ashamed, however your lines are the reflection of your personality and have nothing to do with the reality of the cabin’s condition. We feel sorry for you. A group of 7 adults booked this cabin to watch the most anticipated solar eclipse. We decided to make a weekend out of it and this was the best decision. The cabin was clean, spacious but cozy. Very easy to find although the driveway is quite steep we had no issues driving in. We had plenty of space for all of us and would recommend this beautiful place to anyone that wants to relax and enjoy nature. So glad you enjoyed your stay with us and hope we will have you back very soon. Thanking you very much for sharing your experience. Wonderful cabin in the woods, plenty of space for my group. The owners were kind enough to call and make sure we made it and had everything we needed. Quiet and relaxing. Our priority is to be sure our guests are safe and enjoying their vacation to the full extend. Hope we will see you back soon and we thank you for staying with us. Your vacation investment is protected when you buy Vacation Rental Insurance, which covers you for trip cancellation, delay, and interruption. “Enchanted Mountain Retreats” has in-house Travel Protection to provide you with this important protection and we highly recommend that you purchase with us the protection to safeguard against the unexpected.